iPhone DiskAid from DVD X Studios is a small but useful utility to enable you transfer files and folders via USB between your device and your PC. So you can treat your iPhone as a hard drive and save any files and folder on it.iPhone Transfer fully supports all iPhones including iPhone OS 3.1, iPhone 3G, iPhone 3GS. 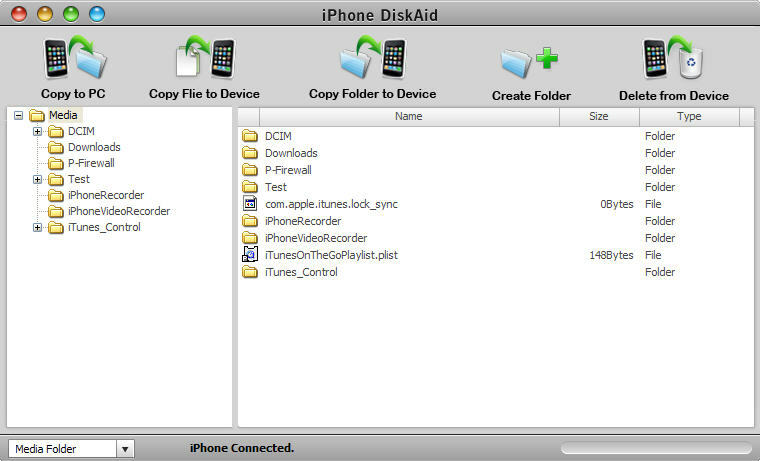 iPhone DiskAid is not only a useful transfer but also a perfect manager for your iPhone. ...... management on PC like folder creation, renaming, file deleting, etc. You can access iPhone directly with USB connected to select any file or folder to transfer between iPhone and PC. All iPhones are supported, including iPhone V1, 3G, 3GS. iPhone could be auto detected once it was connect to PC with USB connector. Copying files between your iPhone and PC is faster than any other software. It allows you to transfer or copy files or folders in batch. So just one step, you could finish all files which you want to transfer. Your iPhone files or folders will be listed in the directory or subdirectory, thus you can easily manage them with renaming, deleting, folder creating, etc. Qweas is providing links to iPhone DiskAid 2.0.0.1 as a courtesy, and makes no representations regarding iPhone DiskAid or any other applications or any information related thereto. Any questions, complaints or claims regarding this application iPhone DiskAid 2.0.0.1 must be directed to the appropriate software vendor. You may click the publisher link of iPhone DiskAid on the top of this page to get more details about the vendor.